Gather and treat your whole family with this yogurt parfaits. A perfect healthy dessert as well. Combine the yogurt with honey and vanilla. In a glass, scoop the yogurt then sprinkled on a teaspoon of flax, homemade granola, spoonful of berries, a few cut up pieces of banana, repeat the procedure. 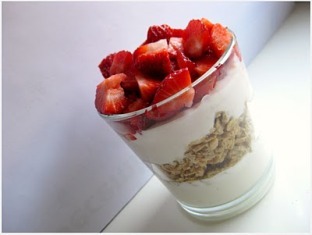 End with granola or berries sprinkled on the top.